Like many others, we first came to Kennebunkport as visitors, enjoying the Southern Maine coast while on vacation. We were walking down Ocean Avenue one afternoon and a painting in the window of Northlight Art Gallery caught our eye. It was a watercolor by Jack Standish. The scene was looking through a window into a room. Very New England in style and gorgeous! So we went in and met Harry Thompson, a local artist, that owns the gallery. I didn’t buy the Standish painting then, but I did fall in love with his work…and Harry’s. Fast forward a year as the new owner of the 1802 House Bed and Breakfast and the first thing I did that first summer was to go back to visit our friend Harry with the intention of purchasing something from him for my new Maine home. In all honesty, I did have the intention of buying something from Jack Standish’s work as his paintings really stuck with me. 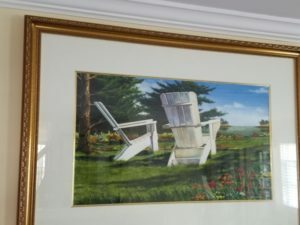 Then I saw the Adirondacks in watercolor that Harry had just finished hanging on the wall. That was THE ONE. It really captured the quintessential feel that is the Maine coast in the summer time. That first painting still hangs over the fireplace in our living room here in the owners quarters. In addition to Northlight, Harry’s partner (and new wife) Jill, owns and runs the True North Gallery in Dock Square. Jill is a very talented artist as well and works in watercolors in addition to oils. Her paintings feature beautiful seascapes in Maine colors. She’s done some wonderful American flags in the last couple of years as well which look like they’ve come right out of an old New England colonial home. We bought one from her last year so we have both Thompson’s on display in our home now! The summer of 2017 has brought some new changes with the opening by Jill and Harry of the Thompson & Company shop next door to Hurricane restaurant. This new shop features eclectic artisan collections. It’s a great store for purchasing gifts and unique collectibles to take home with you. They’re featuring framed photographs of the Three Dories by photographer Stephen G. Maka. 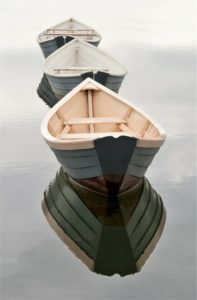 The Three Dories are little row boats built by a local man that sit in the Kennebunk river. And for us, those little boats are the most recognizable image from this area! So, what about the Jack Standish painting that I have wanted to buy for more than five years now? I am very pleased to say that this was the year. We are now the very happy owners of one of his beautiful watercolor paintings as well. When we eventually leave this beautiful place and return to England, we’ll take with us fond memories in our hearts, and some lovely artwork to display, of our time here. If you like to take a little bit of Kennebunkport home with you, we can’t recommend these art galleries enough. They have something for every price range and taste. Happy Shopping!